Eton Wick History: Why Eton Wick still has its commons. The struggle to keep the common land. "May Eton flourish free and ever protect her rights"
is the message on the banner. Throughout the centuries there has been a constant struggle to preserve the common land from enclosure by private landowners. Hardship and poverty in the 18th Century meant that the rights of pasturage and the right to subsistence farm the land were crucial to the village householder and his family. Improved farming scientific knowledge giving better returns from farming made enclosure of the common land in the 17th and 18th centuries an attraction to the rich and powerful in Society. The village householders kept an ever watchful eye for any encroachment on the small land holding around their farmstead or home. 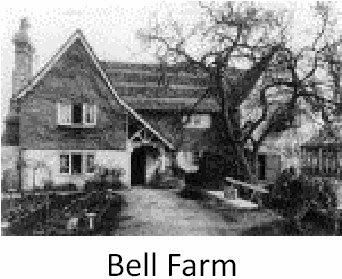 In 1605 a complaint was brought against Henry Bell of Bell Farm for enclosing several pieces of the King’s waste including some pieces of Lammas Land. He also built eight cottages that did not go well with the parishioners. They claimed that the buildings took away privileges and benefits of the common. It appears that Bell got away with his transgression. Several wooded areas within the village, especially around Saddocks Farm, were of fully grown trees and coppice but the use of timber seems to have been controlled by the crown as a later tenant of Saddocks Farm was given the right to take timber for the repair of farm carts and buildings. There is evidence of an elm tree being supplied from Eton Wick for the refurbishment of Eton church tower. In the closing years of the eighteenth century the Crown Commissioners overseeing the enclosure of land showed interest in the enclosure of Eton's Common and Lammas lands. This land was estimated to cover three quarters of the parish but the Commissioners took no action until John Penn, Lord of the Manor of Stoke Poges bought the Manor of Eton in 1793, and started planning to enclose the land surrounding the Manor Farm House. 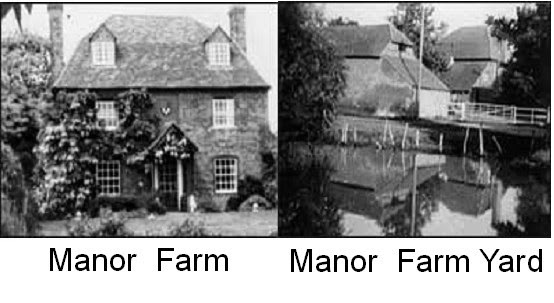 The Manor Farm House, whose origins date to the 1700s, was just a cottage without garden or farmyard as late as 1778. Yet by the end of that century there was a farmyard and by the early 19th century the necessary exchanges had been made so that part of the North Field had become the in-land of Manor Farm. Almost certainly all this resulted from the enterprise of John Penn, Lord of the Manor. He then set about furthering his plans for enclosure of the surrounding land, but plans do not always come to fruition as John Penn in his quest for enclosed acreage found out. John Penn had already succeeded, against heavy opposition, in enclosing Stoke Common where he then denied many poor families their customary right to gather wood for fuel from the Common; this provoked more resentment against him. Bearing this in mind and wishing to calm the situation Penn sought a compromise, in his planned bill to Parliament for enclosure at Eton, and he specifically excluded the Eton Great Common from his proposed Bill. However, the Bill was presented to Parliament without any consultation with the Crown Commissioners or allowing them an opportunity to appoint their own Enclosure Surveyor. 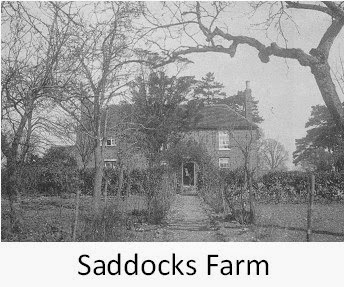 The Crown Commissioners, when viewing Penn’s proposal, realized that problems would arise because the strips of land attached to Saddocks and Manor farms were so intermixed and the Crown Farmhouse (Saddocks) and Penn’s Farmhouse (Manor Farm) were in such close proximity to each other that it would pose a difficulty. As Officers of the Crown belatedly became aware of Penn's plans they realized it was too late to do anything except oppose the Bill. The Enclosure issue did not only draw battle lines between landowners; townsfolk and villagers also took up the fight as they became worried about losing their rights of pasturage. No doubt, after much debate, argument and defamation of Penn’s character by the local citizens they eventually took the only course open to them - they presented a petition to Parliament protesting that the Bill would diminish the livelihood of the inhabitants by depriving them the use of the lammas lands, thereby increasing the burden on the Poor Rate. Over 180 people signed the petition or made their mark if they could not write , and among them were Joseph and Phillip Tarrant, John Atkins, Thomas Goddard and others from Eton Wick. Other parishes had presented petitions, often in vain, as Parliament was made up of powerful land owning families together with the new industrial magnates and Ecclesiastical gentry who tended to think in terms of protecting their own interests. As tithe-owners and the main tenant of the Crown, the Provost and Fellows of Eton College had shown interest in John Penn’s proposed Bill. As many old Etonians were Members of Parliament there is the possibility that College had some influence in managing the vote and supporting the Crown in opposing the Bill. This will have to remain as speculation: the theory cannot be proven as the records were lost when the Houses of Parliament were burnt down. The parishioners' opposition to Penn’s plan for enclosure led to a standoff that lasted until the Bill was defeated on 1st May, 1826. With much rejoicing the town and village celebrated with bonfires and feasting, no doubt helped along with the beer and home made wines of the day. 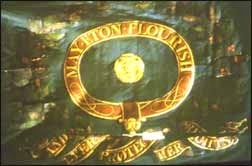 A blue silk banner emblazoned with the words 'May Eton flourish free and ever protect her rights' was paraded triumphantly through Eton proclaiming the feelings of farmer and cottager (see picture at the top of the page). No other Bill for the enclosure of Eton was ever presented to Parliament. The people of the parish continued to be vigilant in preserving their rights, even to the extent of taking a man to court around the year 1840 for building two houses on part of South Field near the village. It was his own land: yet when the case was tried at Aylesbury he was ordered to pull them down because they were built on Lammas land. When in the middle of the nineteenth century the Crown once more became interested in enclosure, the College opposed to it and the Penn estates were 'in circumstances that rendered it difficult’. Some 76 years later, in 1902, the Crown negotiated with the Lord of the Manor to overcome the inconvenience of the scattered strips and holdings. Lammas and pasturage were also exchanged, but the rights were untouched. As late as the 1920s some householders were still exercising their rights to graze a horse or cow on the common or on other peoples fields from August 1st to October 31st.